The Fred Hughes 10 was run in ideal weather conditions for penguins but BRIAN WHITE finished first 60 plus and 102nd overall in 67 minutes 45 seconds. He was five minutes ahead of his nearest rival. 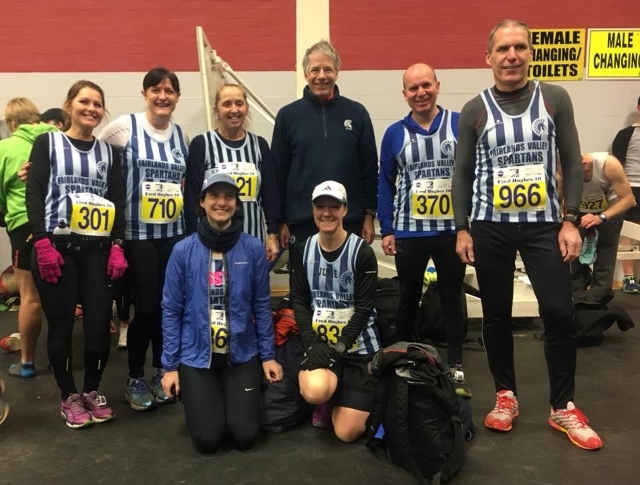 On a day when events like the Windsor Half Marathon were cancelled due to the weather 754 finished the race which included the Hertfordshire County Championships for seniors. STEVE & ISABEL GREEN both managed course bests (figure of 8 course) on the undulating and snowy event. Steve, ran his 12th Fred Hughes, in 01:12:00 (169th place) and Isabel, running her 10th FH10, finished 372nd in 1:23:59. Despite the conditions JIM BROWN was 15 seconds quicker than last year with 1:23:40, just making it into the top half of the field. GARETH COWELL finished with a useful 1:17:43. KAREN ELLIS was second Spartan woman with an excellent 1:24:59. JULIE SHADBOLT ran a new personal best of 1:32:50 with KAREN PALMER just three seconds slower at 1:32:53. SHARON CROWLEY was pleased with her 1:42:41. Spartans in Spain succeed at Santa Pola. 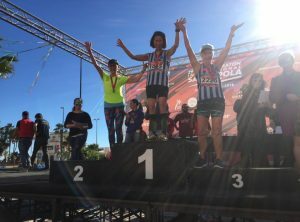 While nine Spartans were shivering at the County 10 miles championships in St. Albans two were winning prizes in sunny Spain. 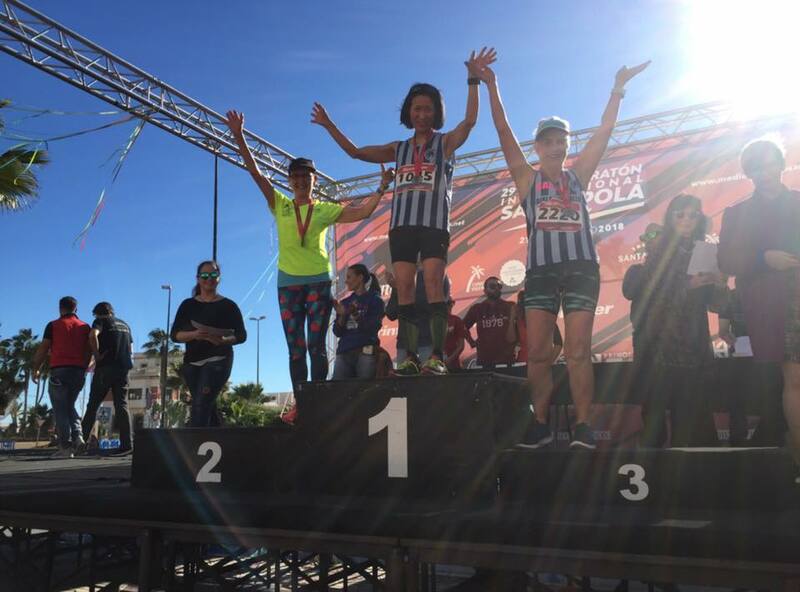 Yuko Gordon and Cathy Craig achieved first and third in their age category at the Santa Pola Half Marathon during a 27 degree heatwave. This was Cathy’s 10th half marathon in Santa Pola in a row and marks 10 years since she became a runner. Yuko finished in an amazing time of 1.39 and Cathy in 2.20. The first year Cathy started running was to run this race. (the temperature rose to 27C not the 23C we expected from the weather forecast) and other runners from the UK had to drop out due to the heat. Yuko was first FV65. Cathy was 3rd FV65, in 2:20. It was tough due to the sun and heat but better than freezing in Stevenage. With one race to go the Spartan veteran men are third in the cross country league. Overall the club’s men are eighth out of the 20 clubs and the women 10th. JOHN WALSH took the parkrun PB honours for the weekend. He notched a new best at Cambridge as he finished in 42 mins 52 secs. Meanwhile VERITY FISHER went to Bedford and completed in 23:35 for a top ten finish. At Peterborough, SIMON BELL just missed a top ten finish in 19:11 while ANNETTE BELL finished 8th woman in 24:40. At wet and cold Stevenage there were no new milestones as far as times were concerned. DANNY SCANLON was first Spartan, 10th in 20:11. NICK GILL (12th in 20:31), DAVE SMITH (14th, 20:45) and BARRY OSBORNE (18th, 21:19) were next. For the women, KAREN PALMER was 10th in 27:15, followed by TRACY PEZ ( 13th in 27:30) and ANGIE KEELING (29th in 29:52). UKA Club Run at Fairlands Valley Spartans on Thursday 1st February. Watford Half Marathon including veteran county championships on Sunday 4th February. Serpentine 5K on Friday 16th February (please note change of date). EMAC track and field event one on Wednesday 2nd May. County 1500 and veteran track and field championships on Monday 7th May. EMAC track and field event two on Wednesday 6th June. EMAC track and field event three on Wednesday 4th July. EMAC track and field event four on Wednesday 1st August.